I do a lot of baking at this time of year. I love giving handmade baked treats as gifts to pretty much everyone on my list from family to the UPS delivery man. But, hey, I know not everyone has that kind of time or desire. I admit it's nice to rely on local pros for delicious and beautifully packaged sweet treats. Just because you didn't make it yourself, doesn't mean it's not made with love. With that in mind, I have two delicious suggestions. At the top of my list this year is a recent discovery (thanks to a tip from a local blogger) - Heavenly Bites out of Wilton, CT. 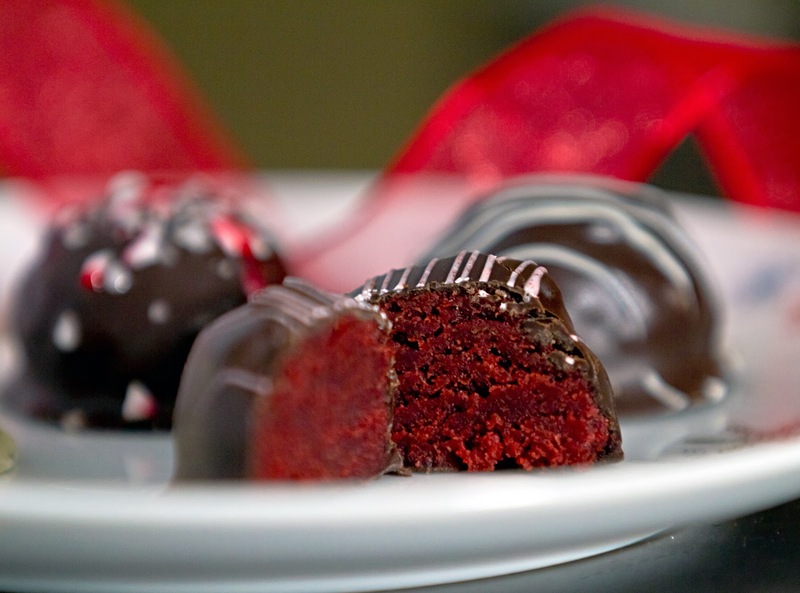 These "bites" are bite-sized cakes mixed with frosting and hand-dipped in a chocolate shell. They are incredibly moist with well-balanced flavors. I don't have a big sweet tooth so I think these bites are especially perfect. You can satisfy a sweet craving without over indulging. Standard flavors include red velvet cake with cream cheese frosting covered in dark chocolate, devil's food cake with chocolate frosting covered in dark chocolate, carrot cake with cream cheese frosting covered in white chocolate and coconut, and lemon cake with lemon frosting covered in white chocolate. Then there are fun seasonal flavors. Right now there's eggnog with vanilla buttercream in white chocolate and devil's food with peppermint icing dipped in dark chocolate sprinkled with crushed peppermint. I have to say the chocolate mint was one of my favorites - deep chocolate richness with just enough peppermint that didn't overpower. All the bites are made to order by hand. Yup, by hand. 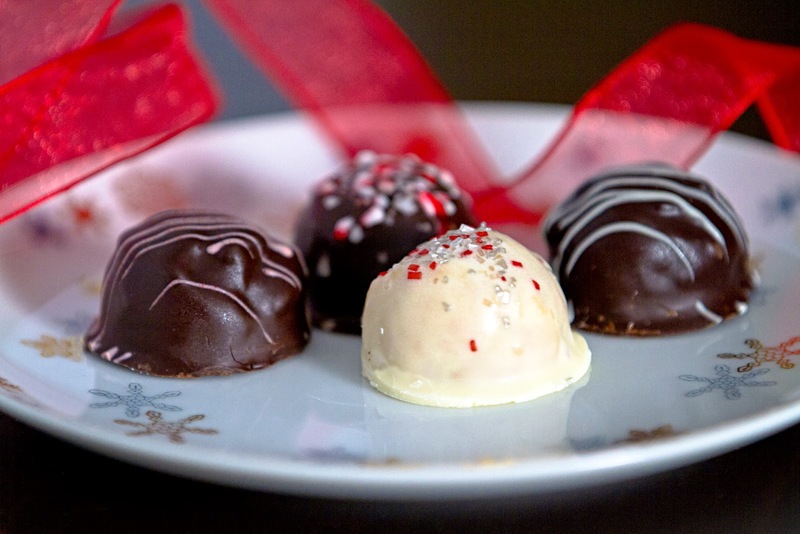 A small wrapped package of 4 would make a perfect gift for teachers, babysitters or whomever. Or, get a party platter for your next holiday gathering. You can order them online for pick up, delivery or nationwide shipping. The minimum order is a dozen and I know it's last minute, but the order deadline to make sure it gets shipped to you or someone you love by the Christmas holiday is December 16th. So, you better get on it. If you're in the area, Palmers Market in Darien, Walter Stewart’s Market in New Canaan, and Wilton’s Village Market are now stocking Heavenly Bites six-packs in their frozen dessert section. Visit http://www.heavenly-bites.com for more info or to order. 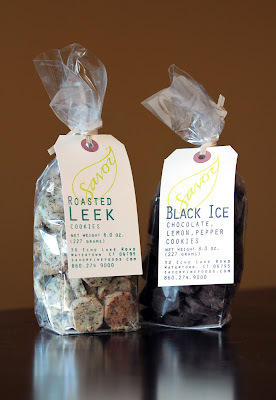 My other top choice for baked goodies made by people with some serious skills is Savor Fine Foods out of Watertown, CT. You'll remember I raved about their cookies in my recap of the CT Garlic + Harvest Festival. The cookies are buttery and come in both sweet and/or savory flavor combinations. I adore the unique flavor combinations like coconut, lime and Salemme hot pepper or chocolate and candied lemon peel with a hint of Salemme hot pepper. Get 3 bags of cookies a month for four months for $100 including shipping. They also have a Cookie Me 3 or a Cookie Me 4 where you tell them the address and they pick the flavors. You could also pick out one to three 8 oz flavors and mark 'gift box' at checkout and they send them to your loved one wrapped in a pretty box. Just a heads up: They ship via UPS throughout the contiguous United States and say to allow 7 days for delivery. Visit http://www.savorfinefoods.com for more info and to order. Thanks for 2 great suggestions. I love the unique and unusual flavors of SAVOR's cookies. They pair beautifully with fruit and cheese and new flavors keep popping up. Savor used to be at the Westport Farmers' Market and we miss him! I am so glad I discovered Savor. I love using them in my antipasto platters. Great ideas, I love those little heavenly bites! They are indeed heavenly. :) Renato has a sweet tooth so they definitely got his stamp of approval.